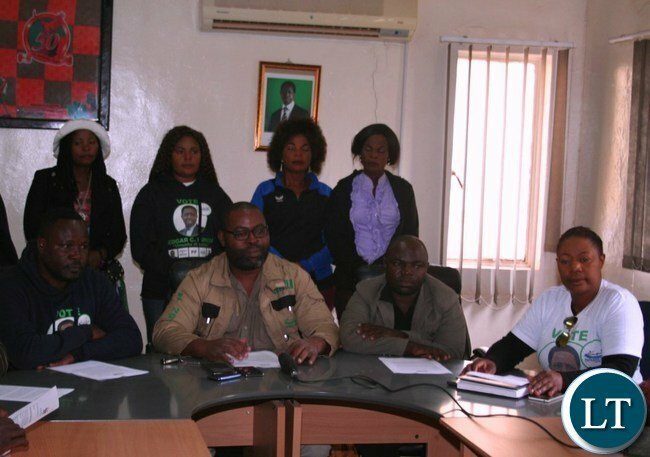 Patriotic Front (PF) provincial chairperson for North Western Jackson Kungo has said offered to sponsor the opposition United party for National Development (UPND) councillors who have been summoned by their party leadership to attend a caucus meeting in Lusaka. UPND has asked its councillors countrywide to attend a meeting scheduled to take place in Lusaka at Kupark Lodge in Chilanga. According to an internal memorandum dated August 2, 2018 addressed to all councillors and signed by party Secretary General Stephen Katuka, the councilors have been asked to meet their own expenses. Mr. Katuka has asked the civic leaders to meet their travel, lodging and food expenses and offered to negotiate for rates on their behalf at the lodge in order to reduce the expenses they are to incur during the caucus meeting aimed at finding a lasting solution to the predicament that has befallen the party. He insisted that it was of great importance that all councillors turned up for the meeting because the meeting would strategise on how to manage party activities including membership retention. But Mr. Kungo said it was ridiculous for the UPND to summon its councillors across the country to attend a party caucus meeting using their own resources without regard for the challenges they were going through. “How do you expect councillors from as far as Chavuma in North-Western Province to sponsor themselves for a party function? I think this is not fair,” he said. He added that he was ready to pay for councillors to allow them attend their party meeting in Lusaka. Yes we need people like Kungo to pay for other parties. Share the PF resources. One Zambia. Upnd at its best. Awe suwa. Jackson Kungo should relax! !its leaders like him who are tarnishing PF’s good image.How should he waste his money on UPND matters?Kungo must control himself.How many UPND’s councillors are in North Western?a lot,so from where will Kungo get the money to pay for all UPND Councillors?President Edgar Lungu and Hon.Davis Mwila should cage this Luvale chap (Kungo)!!! and how broke the old fella (William Tekele Banda) is today under greed “cuundu chaitwa” chairman Kainde’s leadership! !Kungo could be the same soon as days are numbered!! !So bwana Kungo,look after your stolen money wisely! !All Zambians remember how well Mike Mulongoti,Nevers Mumba,GBM,Kambwili,Mutale Nalumango,Dr.Brian Chituwo,Mr Mangani,Mwenya Musenge,Sylvia Masebo,etc looked while in office (power) and HOW BROKE THESE NIGGAS ARE TODAY…..KKKKKKKK…..So its all ROSES while in power..and its DARK DAYS when out…So Kungo look after your money wisely!!! ‘ “How do you expect councillors from as far as Chavuma in North-Western Province to sponsor themselves for a party function? I think this is not fair,” he said. He added that he was ready to pay for councillors to allow them attend their party meeting in Lusaka’. Kikikiki..I love this Kungo guy, hitting the nail on the head. Lazy jj, don’t be too lazy, your tribal mate’s councillors need help! All you pf fellows are dull, if upnd is dead as you all assume why do you waste your time getting yourself involved in their affairs? No wonder wisdom tells us that common sense is not so common after all… since pf is such a popular thuggish party just enjoy your fruits why concerned your self with a failed party like Upnd? I guess this quotation is too complicated for y’all let me enlighten you.. because you seem to have all to say about upnd to me this only means that you’re fully aware how powerful this HH and this GBM with this upnd ???????????????????????????????????????????????? suckers..
is this the way PF was running when they were in opposition say somewhere in 2009,2010,2011? was PF showing signs of dying out completely such that people start to perceive things in the party are going bad? if not i implore the opposition to prepare well for 2021 or brace for the worst and most painful defeat. if this is the way things were, then i urge the Ruling party to start working to the appease the Zambian people of brace for recording the shortest term in power.